QUT Open Day is coming up at Gardens Point on the 31st of July and is the perfect way to find out all the great things QUT has to offer, whether you’re a prospective student or already here! Why not see what students are thinking, saying and doing? QUT Sharehouse is a student blog made by students for students. See how Roseanna transitioned from high school to university, find out how to #stressdownday with slippers and mini road trips and get some great (and funny!) study tips from current QUT students. If you are not sure which direction to take in you studies you can discover all about your study options is the Real Choices: A guide to undergraduate study in 2017 (PDF file, 5008.5 KB). This is a great place to get some advice about choosing or changing to a course that is just right for you. And most importantly…The Library! There are two libraries at Gardens Point campus, the main library (A.M Fraser) at V Block, and the Law Library at C Block. We also have libraries at Kelvin Grove and Caboolture too. So if you have study questions or need some help finding information, give us a call, pop in and say hi or chat to us online, we are always here to help! For all you social-media fiends don’t forget to Instagram your pictures and add the hashtag #QUTOpenDay and #QUTLibrary. 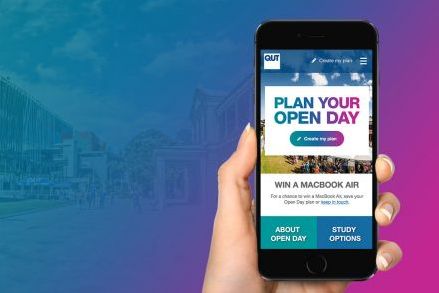 For more information about QUT Open day head to the QUT Open Day website.